Pattara Resort & Spa : Located in A.Muang area of Phitsanulok. The address of Pattara Resort & Spa is 349/40 Chaiyanuparp Rd. A.Muang, Phisanulok 65000, Thailand. Pattara Resort & Spa aims to provide a comfortable stay by offering spacious guestrooms with standard facilities. Pattara Resort & Spa is a great choice for leisure travelers. Ayara Grand Palace Hotel : 99/5 Wisutthikasat Rd.,A,Muang,Phitsanulok 65000 Thailand. Located on U-Thong Rd.,The hotel just a few miunte's drive to Night Bazaar,10 minutes drive from Phitsanulok Airport and within short distance to cultural sites,shopping haven,resturants and vibrant nightlife.The city's famous for Wat Phrasimuhathat away from our hotel 10 minutes by car. The La Paloma Hotel : 103/8 Srithamtraipidok Rd. Tel. (055) 217930-6 Fax (055) 217937 BKK.Tel. (02) 9385570 , just south of the Indra Hotel, is a six storey, luxury hotel with a family orientation -- they will arrange day care with advance notice. Rooms with all the amenities start at 500B. Suites sleeping four cost 1,700B, but if the hotel is empty you may be able to get a suite for 600B or 700B. Amenities include a restaurant and swimming pool. Amarin Lagoon Hotel : 52/299 Phra Ong Khaw Rd. Tel. (055) 220999 Fax (055) 220944 BKK.Tel. (02)6684277 , is located around 8km out of town on Highway No.12. The hotel boasts landscaped ground, lush garden, a fitness centre and a swimming pool. Rates run 800/900B single/double. The Topland Plaza Hotel : 68/33 Ekathosarot Rd. Tel. (055) 247800-9, 245390-1 Fax (055) 245395, 247815 BKK.Tel. (02) 2150575, 2156108 , is connected to Topland Plaza shopping centre at the intersection of Singhawat Rd. and Ekathasarot Rd. It's a luxurious place with a beauty salon, cafe, snooker club, fitness centre, several restaurants and other facilities. The room rates start at 800/900B for a single/double, which is a bargain compared with Bangkok or Chiang Mai price for similar quality. Free airport transfer is available. Amarin Nakorn Hotel : 3/1 Chao Praya Phitsanulok Rd. Tel. (055) 219069-78 Fax (055) 219500 , from 550B. A 24 hour restaurant attached to the hotel serves Chinese and North-Eastern Thai cuisine. Pailyn Hotel is centrally located : 38 Boromtrailokanat Rd. Tel. (055) 252411-5 Fax (055) 258185, 259534 BKK.Tel. (02) 2157110-2 , has rooms starting at 792/924B single/double, including breakfast. The Grand Riverside Hotel : 59 Phra Ruang Rd. Tel. (055) 232777 Fax (055) 232789 offers good upper-range value. All rooms come with air-con, hot-water showers, carpeting, TV and telephone starts at 1,100 Baht. Rajapruk Hotel : 99/9 Phra Ong Dam Rd. Tel. (055) 258788-9, 258477, 212727-30 Fax (055) 251395 BKK. Tel. (02) 2294496 , offers good upper-range value. All rooms come with air-con, hot-water showers, carpeting, TV and telephone for 600/800B for singles/doubles; there are alsomore expensive suites available. This hotel has a swimming pool. Thep Nakorn Hotel is another good value place is the six storey : 43/1 Srithamtraipidok Rd. Tel. (055) 244070-4 Fax (055) 251897 ,where quiet air-con rooms are 500B, suites 1,500B, American breakfast included. Nan Chao Hotel : 242 Boromtrailokanat Rd. Tel. (055) 244702-5, 252510-4 Fax (055) 244794 BKK.Tel. (02) 2781749, 2790136 , from 900B. Golden Grand Hotel : 63/28 Phra Ong Dam Rd. Tel. (055) 210234-7 Fax (055)210887 , next to Chang Pheuk Hotel. Rates start at 650/750B for one bed/two beds, and all rooms come with air-con, IDD phones, fridge and TV. Rajapruk Guest House Hotel : 99/9 Pra Ong Dam Rd. Tel. 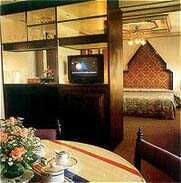 (055) 259970, 259203 Fax (055) 251666 , where rooms with fan and hot-water showersa go for 250B (great value), air-con 360B. Guests may use the Rajapruk Hotel swimming pool. Indra Hotel : 103/8 Srithamtraipidok Rd. Tel. (055)259188, 259638, 258085 , south of Phutthachinnarat Provincial Hospital (Phitsanulok Teaching Hospital). Clean air-con singles/doubles with TV are 300B to 600B. Sivathep Hotel : 110/21 Prasongprasat Rd. Tel. (055) 219146-8, 244933-4 Fax (055) 244933 , were once the top end in Phitsanulok. Both offer clean rooms with fan or air-con and TV ranging from 230B to 400B ; the Sivathep has a slight edge in quality. Pansombat Hotel : 4/1 Sailuthai Rd. Tel. (055) 258179 on the left side of the road. Rooms with private shower and shared toilet are 100/200B, or 150/300B with toilet. Sukkit Hotel : 20/1-2 Sailithai Rd. Tel (055) 258876, is a better deal at 150B for a clean room with fan and private bath. Although it's strictly basic and a little dark, it's centrally located a block from the river, Sailuthai Rd. changes name to soi 1,Phuttha Bucha Rd., where you'll find the best cheapie in this . London Hotel (formerly Chokeprasit Hotel) : 21-22 Soi 1, Phuttha Bucha Rd. Tel. (055) 225145. It's an old Thai-Chinese hotel that has been spruced up and painted in cheery colours; clean rooms with share facilities are 150B. Siam Hotel : 48 Athitayawong Rd. Tel. (055) 258844, 219433-4 is an old-fashioned four storey place a half block from the river and main post office. Large rooms, all with private bath and ceiling fan, cost 150B single, 200B Double; those towards the back are considerably queiter. You might want to have a look at the rooms before taking one -- some are cleaner than others; if you get a clean, quite one, this is good value. Asia Hotel : 176/1 Ekathotsarot Rd. Tel (055) 258378, 219401 Fax (055) 230419 , with quiet decent singlr/double rooms for 200/300B, air-con for 350B to 400B (singlr) and 450B to 500B (double). Street noise can be deafening, so ask for a room towards the back of the hotel. Phitsanulok Youth Hostel : 38 Sanambin Rd. Tel. (055) 242060 Fax (055) 210864 stands well above all other Thai hostels associated with Hostelling International. Supachai, the owner. Hollywood Guest House : 268/99-100 Boromtraiklokanat Rd. Tel. (055) 258108, south of the city centre on the way to Wat Chulamanee, has dorm room for 70B per person, rooms with shared facilities for 100B, or with private toilet for 120B. An air-con room cost 200B. The English-speaking owner will provide free transport from the bus or train station if you call. He maintains an office in the of town near the clock tower, at 112 Boromtrailokanat Rd., where he may add more rooms and a coffeeshop, or so he says. You can buy city tour and out of city tour at the hotel counter.